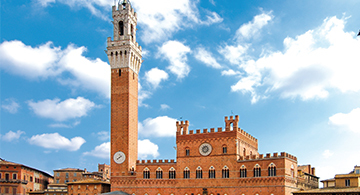 Close to Florence there is a wonderful castle, part of Lionard Luxury Real Estate’s portfolio of luxury properties for sale. Reinforced by Guelph-style crenellated walls that are entirely walkable and interrupted by four corner towers, this estate measures 3,000 sqm and features 750 hectares of grounds cultivated with olive groves and vineyards that currently produce high-quality extra virgin olive oil and wine. This property also includes an historical villa measuring 1,000 m2 and 25 farmhouses. This castle is a truly priceless architectural gem. 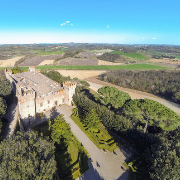 Owned by the Pucci noble family, this castle must have been built in 1424 by the famous architect who also designed the Dome of Florence’s Cathedral, Filippo Brunelleschi, as Professor Massimo Ricci, the highest expert on Brunelleschi’s architecture, maintains. 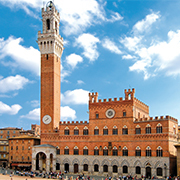 Clues to this prestigious authorship are, among others, the use of the same brick-layering technology used for the Dome; the big number of works such as doors, windows, corbels, and furnishings masterfully designed in Brunelleschi’s style; and a walkway standing on a half-vault system. The latter seems like it is not made to stand, if it weren’t for the creative brilliance for which this world-famous artist and its works are known for. This attribution thus adds a very high value to this estate’s already valuable elements, such as its Renaissance style inner courtyard with graphite plaster, the majestic hall used for receiving family and friends, its charming cellars, and a private chapel for religious services. But there’s more: this impressive castle for sale also witnessed an ancient and prestigious history. 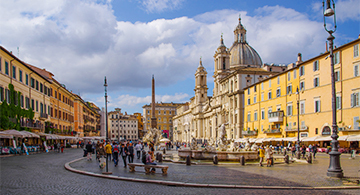 Central figures of Italian history stayed here: such as Popes Leo X and Clement VII, who were Lorenzo dei Medici’s second son and nephew respectively, and Pope Paul III Farnese, who convened the Council of Trent and established the Congregation of the Holy Office. There is still an inscription in the hall that honours his 1541 stay. Lorenzo the Magnificent, Grand Duke Ferdinand III of Tuscany and King Victor Emmanuel III of Italy also spent some time in this manor. 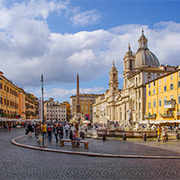 Due to its high location and sizeable structural features, in 1944the estate was used as a military command by General Mark Clark to coordinate Italy’s liberation during WWII. 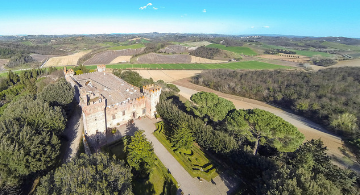 Kept in excellent conditions, this castle is currently a modern and elegant farmstead producing high-quality Tuscan goods and a venue for elegant high-end events.